Okay - so all your comments (almost 500) on yesterday's posts have been SOOOOOO fun to read. I love reading all the different things! Hilarious! The girls went to MDO today and they were both happy to go. 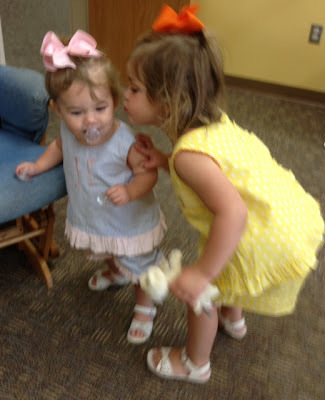 They can have their share of fighting but it was so sweet today because Harper went in Hollis' room and got toys out for her and said "You have a good time today Hollis" and kissed her. Love that. Harper insisted on bringing a puppy to school with her. I got to have a few hours to get things done around the house and then I met up with some of my favorite friends for lunch. We went to Flying Fish. It was so good and I wish we could have stayed longer. I had to run get my girls from school or I would have visited even longer. Jennifer and Jillian and Brody above! and .................do you live in NWA and do you like Ice Cream? Take a minute and sign up HERE to get the Unilever ice cream truck to bring a party to you!Scroll down the page and fill out the form. It could be your office, your play group, your neighbor friends, your Bible Study, anything.....fill it out and you could win amazing ice cream (Magnum, Breyer's, Ben and Jerry's)! There will be several winners so hurry and sign up!!!!! !